What does it mean to stand in your light? To live the choices that resonate with your heart? To know with that deep knowing that you are here right where you need to be? To have the strength to follow your heart’s lead? To show the world who you truly are? The theme for my new art show, Stand in the Light, has been emerging for several months now. What started off the whole journey was Skunk. You know, those black and white stink bombs we all avoid? Have you ever watched a skunk saunter through your backyard with their head held high seemingly without a care in the world? It is amazing to watch as long as you hold your nose carefully closed. I work with animal medicine on my spiritual path. Some months back, to my surprise, I drew a Skunk card. Say what? Skunk energy is about how we reflect what we believe about ourselves in how we carry ourselves. When I discovered this message, I took a long hard look at myself in the mirror, literally and figuratively. How do I carry myself in the world? How do I hold my body? What do I wear? How do these choices reflect what I believe about myself? This began a creative conversation with myself in which I consciously changed how I presented myself out in the world to better match what I believed about myself. My style of dressing changed - an abundance of pink rhinestones proliferated, studded black cowgirl boots arrived. The process of calibrating my outward self with my inward beliefs included what I created as well. My Muse transformed herself into a black haired punk with a wicked wit and a warrior stance. Not someone to mess with! I was moving through my Color of Woman Method training when this all began and used that venue to practice standing in my light as much as possible. And, when we came together at our graduation weekend, my painting reflected my work. 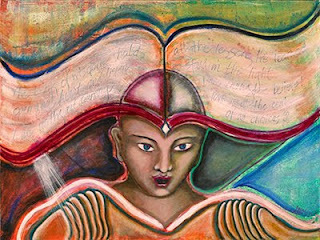 The being who came through has a book on her head - a book of wisdom with all the lessons she’s learned. They are not forgotten, instead they are honored and used to guide her. She wears Armadillo on her shoulders to set boundaries delineating the container of opportunity in which she lives and moves. Light sparks from the book as she speaks her light. She is power-filled and alive. She is determined, courageous, and standing in her light. I invite you to stand in the light with me! What do I believe about my art?